If you have missed the first three steps in this “Organize Your Home in 6 Steps” series, you can check them out here. Step 1: Discover Your Dream Life, Step 2: Declutter & Organize Your Closet, Step 3: Declutter & Organize Your Books, and now Step 4: How to Create a Home Filing System & Get Rid of Your Stacks of Paper. NOTE: This series is based on tips from “The Life-Changing Magic of Tidying Up” by Marie Kondo. If you haven’t watched her Netflix show yet, what are you waiting for?!! You will be so inspired to declutter your life. Also, this is not sponsored and I do not make any money off of the links I’ve attached. Lavender and Wild Orange Essential Oil diffusing to calm any stress and to keep your mood up! Tip: If you work in an office, ask your office manager/receptionist if they have any of the above items that they don’t need anymore. I’ve been gifted many of these items by my office manager who was rather excited to get these things off of her hands. And if you attend one of my online or in person doTERRA classes you can win a free wild orange. 🙂 why not?! Yes all of your papers. I’m not kidding. Walk throughout your entire house and gather up all of your papers. If you have a home office I recommend sorting your paperes there as that is where the vast majority of your papers will most likely be. If not, you can use your kitchen table or even the floor to get started. So gather up all your papers and bring them to your office or a table where you can lay things out easily. Expenses – You may want to break this down into further categories depending on what you can write off at the end of the year or what you are wanting to track. So for a while, I kept a folder for “groceries” because I was tracking how much money we actually spent on them each month. But usually, these types of folders would be subcategorized “Expenses: Ruth’s Phone Bill” because I write that off at the end of the year. Another example, “Expenses – Rent Receipts” etc.. Another option is to break this down by month. So each month would have its own folder and you would simply write on each receipt what it was for and put it in the expenses folder for that month. You will organize these into the box. I have decided that my home filing system will be organized by year. Because we have a lot of our papers online now, we can often fit 2-3 years in a box. I’ll address how to label the boxes at the end of the post. Leaflets for Products/Manuals for items you own – Big question: can you find the manual online? If so, then I recommend recycling the manual. Why keep it if all the information is available online to you? If not, then I would recommend storing manuals in a file folder or in a ziploc bag in one spot – like a cabinet shelf. Invoices – This is meant to be for invoices that you have given to people that they have paid so that you have a proof of payment. Make sure the date you received payment and HOW you received payment is listed on the invoice. There’s a great system you can use called “Wave Accounting” that my husband and I use for giving and tracking invoices and payments etc… It’s free to use and works really well. They’re not paying me to say this I just like their program. Sentimental – You’ll need to decide if you want to scan these sentimental letters etc.. into your computer so you can store them online OR if you want to keep them in their own folder/box. A big question is, where will you keep them? You may want an entire box kept for sentimental items and you may choose to store them in your closet or put them on display on the coffee table etc…. Here’s the thing. I recommend only keeping them if you know that they will a) bring you joy (a la Marie Kondo style) b) that you will actually look at them or c) if you can repurpose them into an ornament or display them somehow. You can put photos into a photo album and store that on a bookshelf so people look through them from time to time. I like to use “ChatBooks“ to make printed books of all my pictures. I can make my own books uploading the pictures I want as I go, or Chatbooks will make booklets for me using my Instagram and/or Facebook photos! How cool is that? They are so beautiful and I’m so glad we got them! If you use this link you’ll get $10 off your first photo book! The key to keeping your home filing system up and running is to create a time each week or every 2 weeks or even every month that you actually go through the mail and sort it into the folders you’ve made. We went to the dollar store and got a little mail organizer and put it by the front door. We store mail and receipts there as they come in throughout the week and then every Sunday we go through the receipts and mail and sort them into 3 categories: Recycling, Filing, Take Action. TIP: sort your mail near a garbage/recycling bin so you can immediately throw out the items you don’t need. What’s important is that you immediately take action on the “take action” categories. This is why it’s so helpful to plan 30 min- an hour to deal with receipts and to open the mail once a week. Sit down and pay the bills you need to pay. Write the confirmation number that you paid them on the bill. Write in your calendar the day you’re supposed to bring cookies for your daughter’s class. Set a reminder two days before so you make the cookies you just got the flyer about. etc…. When all action items have been taken, separate your “Take action” into “Filing” or “Recycling” again. When you’re done, file the items. If you stay on top of this each week, it should only take a half hour at most to complete this task. You’ll be saving yourself SO much trouble at the end of the year. I love to give helpful documents to people. 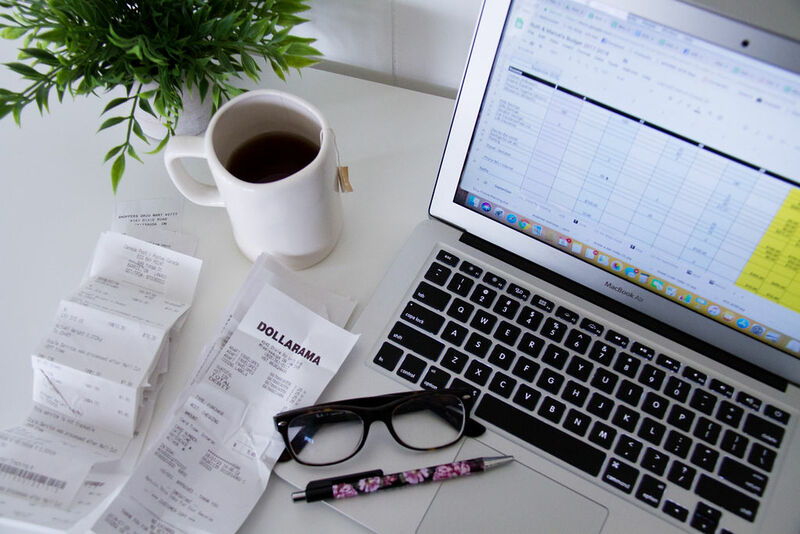 So I’m giving away a free excel sheet download that Marcel and I use every year to keep our expenses/income organized in an online home filing system. We fill it in as we go and just send it to our accountant at the end of the year who LOVES how organized it is. This spreadsheet organizes and automatically tallies up your expenses/income into a quick look on the front page as well as a detailed break down of receipts and income in following tabs. The main rule is to never edit a column that is highlighted yellow as it has a formula in it that tallies things up for you. Enjoy! Get your free worksheet to organize your income and expenses easily so your accountant has it all in one place! You are almost done with your home filing system! When the box is full, label it for the time period that it represents. For example “Jan 2017-Dec 2019”. Write this on the front, on the side and the top of the box so that no matter how you stack it, you’ll be able to see what’s inside. Store this box in a safe place. I keep mine in a storage closet, but lots of people will use their basement (just make sure it’s not on the floor in case of flooding), or in a safe, or even in an offsite storage unit if you have lots to file away. That’s it! You’ve done it!!! Well done organizing your papers! I’m so proud of you. If you like this/found it helpful, leave a comment and share it with your friends! Thanks, everyone!